Partners Toshiba and SanDisk have developed 15-nanometer process technology for NAND flash memory widely used in smartphones and tablets. The development is the first in the world and will replace the second-generation 19-nm process technology when production begins at Toshiba's plant in Yokkaichi, Japan, Toshiba said. Process technology refers to the method and size in making chips. NAND flash memory is a storage medium that does not need power to retain data. 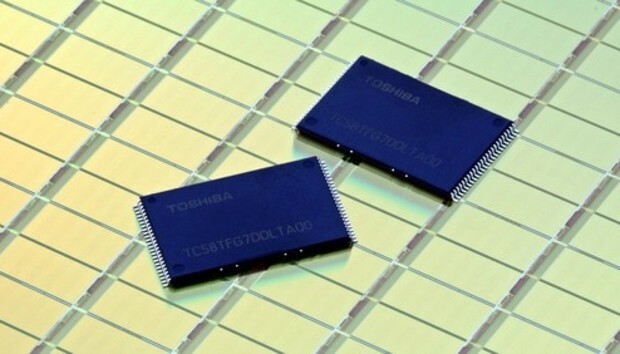 The 15-nm process technology will be applied to 128 gigabit (16GB) NAND flash memory with two bits per cell, Toshiba said. By using a high-speed interface, the new chips increase the data transfer rate to 533 megabits per second, which is 1.3 times faster than the 19-nm process technology. The Yokkaichi plant in Mie Prefecture near Osaka will begin mass production of the chips at the end of April, Toshiba said. In a separate announcement, SanDisk said the technology will be available as its 1Z-nm process node, promoting what it called the world's smallest, most cost-effective 128-gigabit chips. "Our 15-nm technology will be utilized across its broad range of solutions, from removable cards to enterprise SSDs," a SanDisk spokesman said in an email. "The benefit for the customer is that the technology provides a lower cost structure compared to the previous node, which is 1Y-nm."